Food for thought on Furnaces and Water heaters. 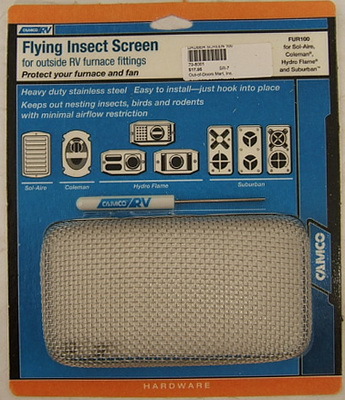 If you have an RV this is a good preventive maintenance idea.This is of particular interest if you own an older Airstream. 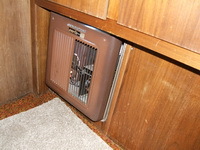 Furnaces in older Airstreams are hard to remove and service. This tip deals with a product that will keep debris(mud daubers)out of your furnace. Thus less time working on your furnace! The debris we are talking about is produced by Wasps, Mud-daubers, and Birds. It is the nesting materials produced by these animals that cause the problem. Once they make their self a home.They will attach their nest to burner tubes, fan blades, and any other place on the inside that will cause a problem. This can be dangerous! The danger comes when the LP gas does not have the correct gas to air mixture. It can also cause the LP to flow into incorrect areas. 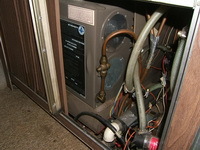 Aside from the danger it is pretty costly to have your furnace removed and cleaned out. It can take up to 3 to 4 hours to remove the furnace, clean it out, and put back into your unit. There is a easy fix for this problem. It is a preventive maintenance, and needs to be done before you have the problem. 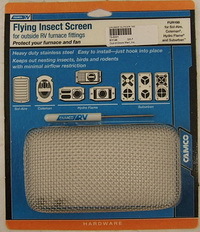 The fix is installing an Insect Screen over the outside vent. And to make this easyer, here is a video on how to install the screens. This "How-to" was provided by Camco. You can see the rest of their videos at. Sol-Aire, Coleman, Hydro flame and Suburban furnaces. Atwood 6 gal, and 10 gal, and Suburban 6 gal Water Heaters.